Chabahar: India’s gift for SCO or for America? 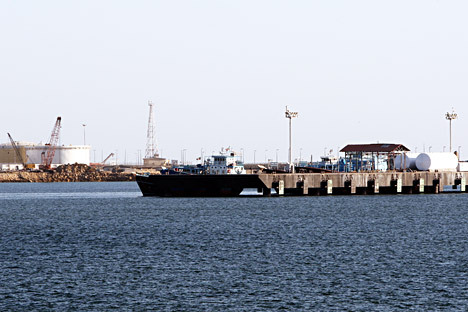 A general view of the Kalntari oil dock of the Sea of Oman near the strait of Hormuz in the city of Chabahar. How is India connected to Central Asia? These and other questions about the reasons for India’s entry to the Shanghai Cooperation Organisation arise as the SCO Summit prepares to admit India and Pakistan into its fold. A major item on the agenda when the Shanghai Cooperation Organization (SCO) summit begins in Tashkent later this week will be the acceptance of India (and Pakistan) as a member. What does India have to do with Central Asia – the area of the SCO’s responsibility? India recently gave a convincing answer in the form of the "Chabahar project." The only question is, for whom is this gift? The SCO, or oddly enough, is it for America? The SCO is the organization for Central Asia’s security and development. It is, in fact, the Central Asian regional organization like ASEAN or the European Union. The role of China and Russia in it is clear; they border with the Central Asian countries. The ‘Chabahar’ (aka Chakhbehar) port is located on the southern coast of Iran, in the Gulf of Oman; it is a bit far from Central Asia. The Indian newspaper the "Pioneer" outlines New Delhi’s strategy. It recalls that the project is an old one, which belonged to the ruling BJP party. It claims the project was shelved during the previous government of Dr Manmohan Singh as he was only concerned about not angering the United States which, at that time, saw red when it heard the word "Iran". After the BJP returned to power, it re-launched the Chabahar project, which the newspaper calls "a giant leap" and a "triumph" of Indian diplomacy. Oddly enough, the government did not ask America for permission. The essence of the project is that India creates berthing facilities in Chabahar, including a free production and trade area (a 16 billion dollar investment), and also builds a railway track through Iran, which connects to the ‘garland’ highway, linked to Kabul. This transport corridor then extends all the way north and answers the question, what does the SCO have to do with it? India, in fact, opens a route to Central Asia, which displays New Delhi’s serious attitude towards trade and all other relations with the Central Asian region. Earlier India had access to Afghanistan through Pakistan, which didn’t like it, and blocked all transit. On the same sea coast, very close to Chabahar, China is working out a very similar project with the Pakistani port of Gwadar. China plans a 45 billion dollar investment and a similar strategy to open the way towards Afghanistan and beyond. It is a typical story of the relationship between the India, China and Pakistan triangle. The SCO’s philosophy at the moment is firmly linked with the transit role of its core members - Uzbekistan, Kazakhstan, Tajikistan and Kyrgyzstan. Almost all business activities around the SCO are built around various kinds of roads going through these countries and connecting the West with the East (the new Silk Road). Transit roads open new opportunities for investment in these countries. The "Chabahar project" for India, however is also the route for oil and gas supplies from Iran, and an opening of the land route to the West including Europe. Chabahar is the southernmost point of the transport corridor project through Iran and the Caspian Sea to Russia, a project that, during Singh’s government, suffered the same fate as that of the Chabahar: nothing was canceled, it was just suspended. Earlier this month, Indian Prime Minister Narendra Modi visited the United States. A question then arose on the topic of “who India is for": the United States, or against China. The media’s general mood is that the US-India understanding is deepening. In Russia, too, there are those wishing to declare once again that "India is drifting toward America." Let's look at the American Foreign Affairs magazine, which is saying that the "Chabahar project" is a gift from the US, and that is how America should take it. It's just one person's opinion, and at a time when America is clearly not up to normal foreign policy, it's an interesting opinion. The author believes the development of the whole region, including Pakistan, Central Asia, and growth of their economies is beneficial to the United States, especially since America has lost all initiative in the region in recent years. The United States could support the Indian idea, keeping in mind its troops in Afghanistan. It even finds the Chinese-Pakistani project Gwadar; Chabahar’s twin; generally beneficial to America, for the same reasons. The States should stop looking suspiciously at all that relates to Iran and what looks like politics, not coordinated with Washington and join the good ideas. India's strategic objective does not in any way involve harm to America. Neither does China set itself such tasks. Russia does not attempt to confront the US either. Simply because America’s collapse will cause a cataclysm in the world that will make all economies not recover for a long time without exception. So what objectives does our partner on the SCO, BRICS set? India under Narendra Modi has again started to show economic records, surpassing even China’s growth rate (more than 7 percent a year). However, each year China adds the GDP of an entire country like Poland or Sweden, even with reduced growth rates. India is not as strong. But, one way or another (and the American article notes this), if India wants to continue to move at the same pace, it will have to increase energy imports by 3 to 4 times in the next decade. Hence, the Iranian-Afghan project, like many other Indian initiatives, includes strengthening relations with China. If the United States understands that the growth of our countries does not pose a threat, but is a norm, someday, with another America and another president, we may even become friends. Why should our countries not be bigger and stronger in terms of the economy and other areas? Another reason is so that America does not try to "deter" us or dictate us anything. But this is not the essence of the problem, but its particulars.